this year I bough about 10 different tuberous drosera tubers. Planted all of them in slightly wet media on 23.8. - all had small stolons emerging. Except macrantha, all of them are still "dormant". Macrantha is now 16cm tall. I hope the tubers are still alive. Would be strange if all ~20 tubers would die. Below photo of macrantha. I bought also seeds od D. afra, D.trinervia, D. cuneifolia, D. moorei, D. stolonifera, D. zigzagia, and tuberous mix. All except stolonifera started to sprout after 4 weeks (trinervia and zigzagia couple of days later). I stratified them under my car window where they got I presume 50+C and when I sowed them they were outside for a week when temperatures droped to +5C for about a week at night. I am really happy they germinated, especially trinervia, as I red that some take years to germinate. Below photos of cuneifolia and moorei. D. macrantha is always the first to emerge for me, usually several weeks before anything else. Congratulation on the germination! Your stratification obviously worked well. In my conditions D. trinervia is not really among those species which need at long time to germinate. 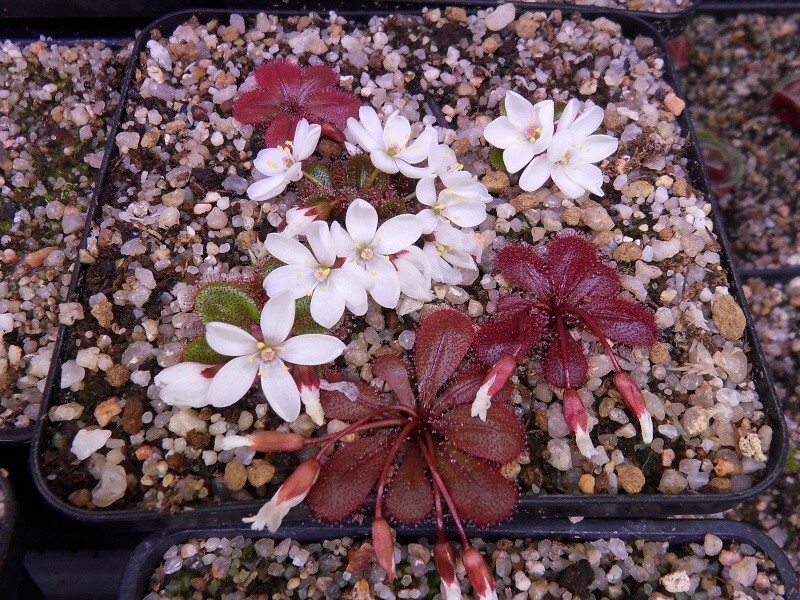 Anyway, just in case you are wondering: the mix may contain seeds of D. stolonifera, D. browniana, D. whittakeri and/or D. aberrans (all of which are more or less round seeds, the D. whittakeri and/or aberrans seeds were obvious as they were larger and do not roll well) plus D. basifolia, D. auriculata and potentially also D. zigzagia (lenghty seeds). I do not fully remember. The mix was not made by accident: One day, when I came home, someone had put the tray with the seed packets away and did obviously do so with lots of energy so that many seed packets had lost some of their contents. As this happened relatively early ( I think in January), the seeds in the mix will mostly be those species which had flowered early in the previous season. I agree with Sean: many D. macrantha are among the first to appear. Usually, D. (aff.) pallida is even earlier in my conditions. If I have a little time, i will also take some pictures as now some D. tubaestylis start to flower, which always is lovely! Lucien. Are you provoking ☺. Amazing plants! Hi all, this is my tuberous sundews mix one year after sowing (sown on 27.7.). Dieter, is it possible to tell which auriculata is it? I keep them all the time in water, I was afraid to let them dry as it is different species. The flowering auriculata is I think daughter tuber - because it started to sprout only couple of month ago. Basifolia looks from the picture went dormant (I did not notice). Next time I would probably try to separate the seeds or tranplant the plants at a very early stage.